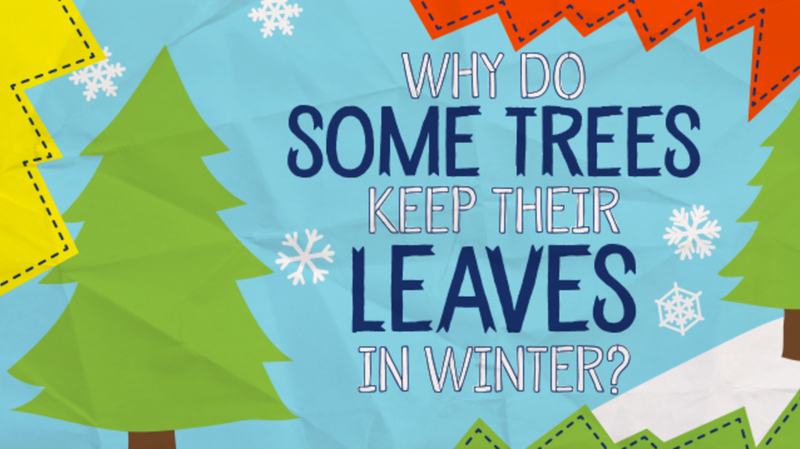 Why Do Some Trees Keep Their Leaves in Winter? WHY? is our attempt to answer all the questions every little kid asks. Have a question? Send it to why@mentalfloss.com. Have you ever wondered why some trees keep their leaves in winter when all the other leaves fall off? Trees have different life cycles, and are either called deciduous (de-SID-you-us) or evergreen. Trees with flat, wide leaves that turn pretty colors in the fall are deciduous. They will drop their leaves when the weather gets cold. Evergreen trees, on the other hand, lose their leaves throughout the year a little bit at a time. First, we need to talk about how trees get food, or energy. Trees use the energy from sunlight and water to turn carbon dioxide into a kind of food. This process is called photosynthesis (foe-toe-SIN-thuh-SIS). The days get shorter in fall and winter, so there is less sun energy to use. Deciduous trees close up the little holes where the leaves attach so they don’t lose moisture (MOYS-chur), or water. This makes the leaves drop off. Evergreen trees don’t have to drop their leaves. Evergreen trees first came from cold climates. (But you can find many in warm tropical rainforests too.) They have very strong leaves rolled up tight, like long, thin needles. This shape allows the evergreens to conserve water, which is needed for photosynthesis. Because they have more water than their deciduous cousins, their leaves stay green, and stay attached longer. Evergreen needles also have a very waxy coating that also helps save water during summer and winter. Christmas trees are generally evergreens like spruce, fir, or pine. To learn more about the lives of trees, watch this short film at National Geographic.